The United States Mint has revealed the design selections for the 2015 First Spouse Gold Coins. This will mark the ninth year for the one-half ounce 24 karat gold coin series honoring the spouses of the Presidents of the United States of America. The releases for this year will feature Bess Truman, Mamie Eisenhower, Jacqueline Kennedy, and Lady Bird Johnson. The obverse design of each coin feature a portrait of the First Lady with the reverse design featuring images emblematic of her life and work. 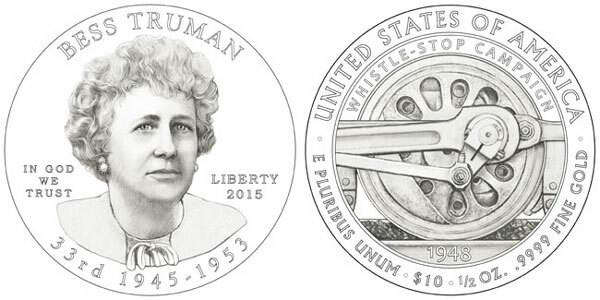 The Bess Truman First Spouse Gold Coin features a portrait designed by Joel Iskowitz and engraved by Phebe Hemphill. The reverse design features a locomotive wheel moving along railroad tracks, representing Mrs. Truman’s support for her husband on his 1948 whistle stop campaign trip for re-election as president. The reverse was designed by Joel Iskowitz and engraved by Charles Vickers. The coin is scheduled for release on April 16, 2015 and will carry a maximum mintage of 10,000 pieces across proof and uncirculated versions. The Mamie Eisenhower First Spouse Gold Coin features a portrait designed by Richard Masters and engraved by Joseph Menna. 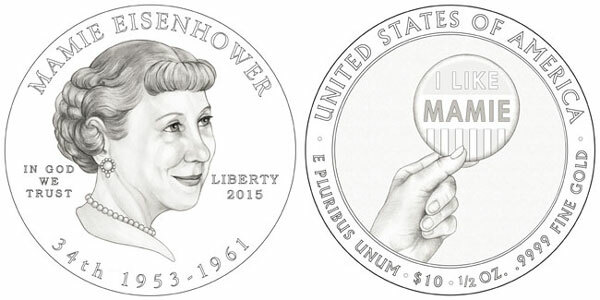 The reverse features a woman’s hand holding up a political campaign button with the slogan “I Like Mamie,” referring to Mrs. Eisenhower’s popularity as a first spouse, her involvement in her husband’s presidential campaigns, and the popular campaign slogan “I Like Ike.” The reverse was designed by Barbara Fox and engraved by Renata Gordon. The coin is scheduled for release on May 7, 2015 and will carry a maximum mintage of 10,000 pieces across proof and uncirculated versions. The Jacqueline Kennedy First Spouse Gold Coin features a portrait designed by Susan Gamble and engraved by Phebe Hemphill. The reverse features the saucer magnolia Mrs. Kennedy chose to be planted in the White House garden and near the eternal flame at her husband’s grave at Arlington National Cemetery. The petals stretch across the globe, its tips connecting the points of some of her most notable diplomatic visits. The reverse was designed by Benjamin Sowards and engraved by Jim Licaretz. 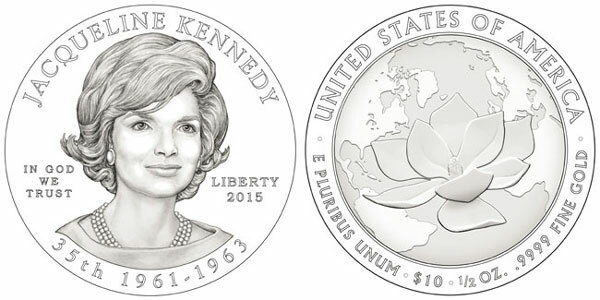 The United States Mint has indicated a tentative release date of June 2015 and a maximum mintage of 30,000 pieces across proof and uncirculated versions. The Lady Bird Johnson First Spouse Gold Coin features a portrait designed by Linda Fox and engraved by Michael Gaudioso. 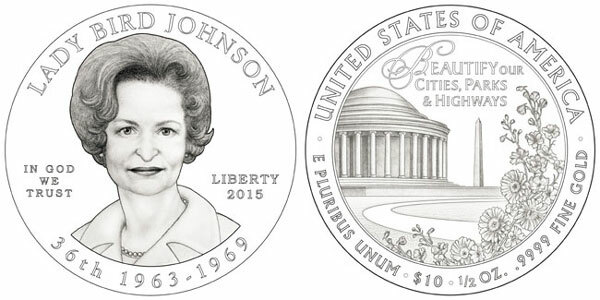 The reverse depicts the Jefferson Memorial, Washington Monument, and flowers in reference to Mrs. Johnson’s efforts in the beautification and conservation of America, which began in Washington, D.C. The reverse was designed by Chris Costello and engraved by Renata Howard. The coin carries a tentative release date of August 2015 and will carry a maximum mintage of 10,000 pieces across proof and uncirculated versions. I think many have been waiting for the John & Jackie Kennedy coins to launch, I doubt whether the series will see any further interest after these issues are released. The US mint while being very artistic missed an opportunity with the whole set of spouses in both mint & proof states. They “Probably” should have taken the husbands accomplishments and placed the women there too. Just because all the flowers on the OBS bombed. That would have tied them into the presidencies. It would have made all the OBS somewhat match and tell a story. A few of the coins did this – Julia Tyler, Sarah Polk, Julia Grant, Frances Cleveland II. These two sets above MS & PF – will be very interesting when they finish the series. and he was very unpopular with the Vietnam War situation.